Living in NYC, it’s easy to replace the fantasies you may have once had about the glamor of the city with gripes about smells wafting from subway grates, trains running late, and grumpy passerby. NYC is a mixed bag in every sense. Somehow, the concept of having so many options for places to go and things to do with your weekends becomes a challenging reality when you realize you just can’t figure out what to do with yourself. Sometimes I find myself picking nothing over something because I haven’t figured out how to make up my mind. Fortunately, I’ve found something do with myself every available Sunday that doesn’t leave me feeling tired and confused about my decisions… Smorgasburg! 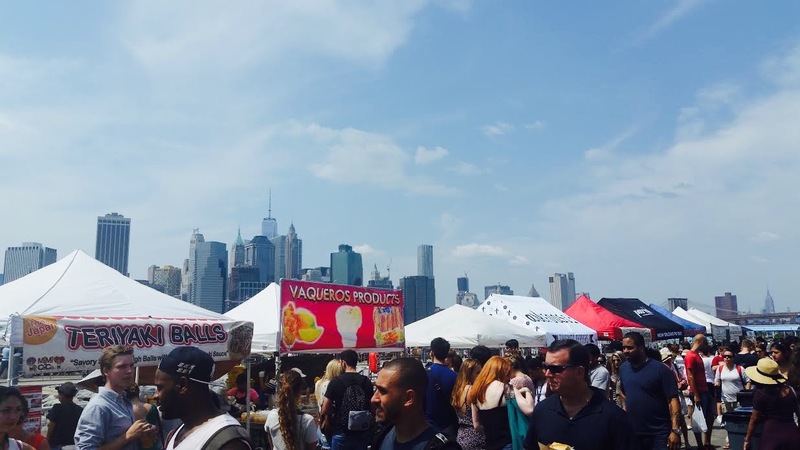 Smorgasburg, an extension of Brooklyn Flea, is an enclosed food fair that runs on Saturdays in Williamsburg and on Sundays at Brooklyn Bridge Park (my favorite). I love it, because with nearly a hundred options for cuisine within the approximate area of a football field, you never have to worry about making the wrong choice. If you grabbed a donut before realizing you’d have preferred a noodle stir fry, you can simply turn the corner and find your alternative instead of agonizing over the “What if?”s that torment NY’s residents and visitors alike. The range may be overwhelming at Smorgasburg, as you can find anything from oysters to ramen burgers, Sicilian to Ethiopian; however, I find that the process is satisfying if you collect samplings from various stands so you won’t regret what you haven’t done, and you’ll experience a range. Gooey Butter Bites from Gooey&Co, bite sized pieces of heaven that taste like lighter, fluffier versions of lemon squares (minus the lemon. Although they do come in interesting flavors, including my favorite, lavender!). I may be the owner, Matt’s, biggest fan. Anything from Bamboo Bites! The Mango Sticky Rice is particularly scrumptious. Ramen Burgers. Getting a Ramen Burger makes for a true NY experience, as you will more than likely wait in a colossal line for your burger and have someone roll their eyes at you if you ask for ketchup (my boyfriend’s experience). Despite the quirks of the experience, the novelty and flavor will make your efforts worthwhile. Milk Truck comfort foods. Amidst all sorts of unusual and unfamiliar options, Milk Truck has reliably fantastic basics. Here you can find grilled cheese, macaroni, and soups that are both delicious and filling. Rice balls from Rice & Miso Everyday. They’re salty with a pinch of spice, served in seaweed wraps, and always tasty. These are my favorite options, but by no means everyone’s! 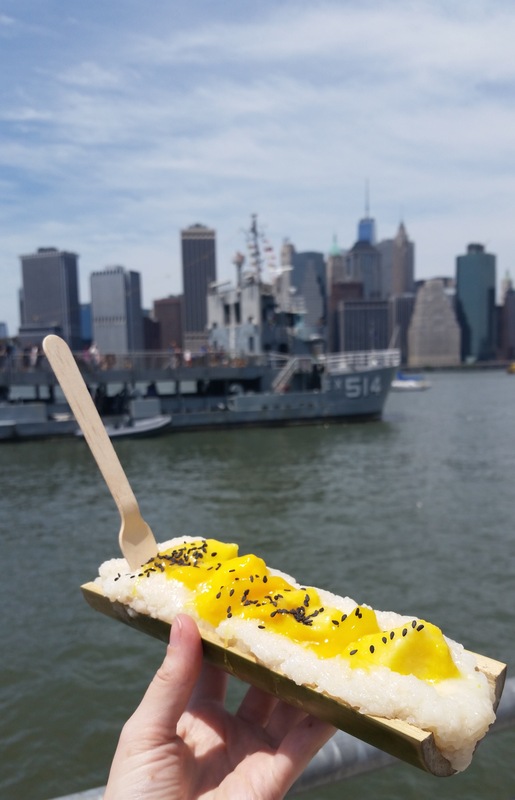 The best thing about Smorgasburg is that there is something there for almost everyone. While I may not spend every weekend vacationing, Smorgasburg tricks me into thinking I do, at least on Sundays. Yum. I have always wanted to go to this market! It’s great! Definitely try it! The city will definitely do that to you. You definitely should! It’s the best.